T-Mobile is unhappy with the how much AT&T is charging it for roaming data and is asking the Federal Communications Commission to intervene. In 2011 the commission ordered operators to provide data roaming to competitors at "commercially reasonable" rates. T-Mobile claims the rates it pays for data roaming aren't reasonable and has filed a petition with the FCC asking the commission to define what constitutes commercially reasonable data roaming rates. What's interesting to me about T-Mobile's FCC filing is that it offers a peek into the normally secret world of wholesale data pricing between mobile operators and MVNOs. The crux of T-Mobile's argument is that AT&T is charging data roaming rates that are higher than what AT&T charges its own customers for data and also higher than what T-Mobile charges its MVNOs and non-US operators for data. The numbers below come from a section of the filing labeled EXHIBIT 2, Declaration of Joseph Farrell, D.Phil. In Support of Petition for Expedited Declaratory Ruling of T-Mobile USA, Inc. Joseph Farrell is a UC Berkeley economics professor and a former Chief Economist at the FCC who was hired by T-Mobile to analyze data roaming prices. The exhibit starts at page 42 of the main document and has its own independent page numbers which are what I refer to as page numbers below. The most interesting statistic of all for prepaid MVNO followers like me is that in 2013 T-Mobile charged its MVNOS less than one tenth what it paid for domestic roaming data. 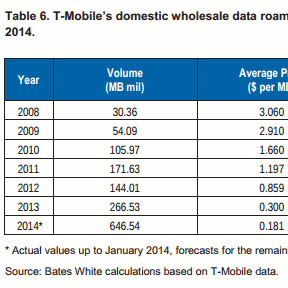 That means that the average price T-Mobile MVNOs paid for data in 2013 was less than 3¢/MB ($30.72/GB). The wholesale data rates that T-Mobile is paying for domestic data roaming seem to be dropping rapidly; from 85.9¢/MB in 2012, to 30¢/MB in 2013 to 18.1¢/MB in 2014 (p31. table 6). If the wholesale price of MVNO data is falling as fast as the cost of roaming data that would mean T-Mobile MVNO's are paying less than 1.84¢/MB or 18.84/GB for data currently. I was surprised at how high wholesale data rates actually are. That MVNO's are paying an average of $30 or even $18 per GB means that the margins that MVNOs operate on are incredibly thin. It also makes it clear why no MVNO can afford to offer a truly unlimited, unthrottled data plan. Quick scan. But $18 per gig is for roaming and only is 1% of t-mobile's revenue. One see why t-mobile charge their prepaid customers $10 per gig as the cost is much lower. And why straighttalk can charge $15 per gig after their volume purchase. And the true cost for someone like sprint maybe really low, like $3 per gig. So, t-mobile can afford to give away .2 gig per month and Freedompop can do .5 gib per month. It is all marketing costs and, relatively, low costs. As much when it only cost someone like netflix 10 cents to stream a movie. 18 cents per megabyte is 18000 cents per gig, or 180 dollars. And u thought I had it bad. Do you have any source on $3/GB? I'm restructuring my whole sale m2m contract and looking for a reference point for negotiation. Any help would be great, thanks. The source isT-Mobile's FCC filing, there's a link to it in the first paragraph of the post. Thank you for providing this data, Dennis. I will say this: the entire thing stinks to high heaven. The data rates are out and out extortion. I would like to see how much wholesale prices are for voice and text, both roaming to MNO's and non-roaming from MNO's to MVNO's. The post says $30.72/MB I think you meant /GB. I've corrected that typo. Thanks for letting me know. The true question is 1MB rounded by 1/8, 1/64, etc.? The TMobile MVNO will charge 10cent/MB and cost 18c/MB(Full), but the user uses 1/10 to 1/2 of MB. That's where i see the profit. Which MVNOs round data up? I know Page Plus and Lycamobile do and PTel, FreedomPop and Airvoice don't. Do you have experience with other MVNO's rounding or not? Dang, I'm paying $5 per gigabyte with AT&T. I felt good about that before this article. Now I feel awesome! Probably 10GB $60 Cricket plan before autopay / multiline discounts. Changes are being made to at least one of the GoPhone plans. Thanks, unlimited data, throttled to 512 Kbps after 2.5GB on the $60 plan. Nice. Sorry to continue the sideways drift here, but I received an e-mail from Voyager with an announcement of big changes to their plans. Might check it out and report on it Dennis. Oh, this captcha is BS! I can't read half the words presented! Can't you at east use the house numbers version? Thanks, I'll check Voyager out. Unfortunately I can't do anything about the CAPTCHA which is something Blogger recently started doing with no way for publishers like me to turn off. A workaround is login to any Google site (Gmail, Calendar, Search, YouTube etc.) before coming here to leave a comment. You can still comment anonymously but being logged in tells Google you aren't a bot. In regard to Voyager Mobile, that Sprint MVNO's prices are higher than Sprint Prepaid. For $35.00 at Sprint Prepaid, you receive unlimited domestic voice calls, text and 1GB of data. If you need to roam, you receive 50 free voice minutes. If you happen to live in a state where the purchase of point-of-sale prepaid cards are not taxed, then it's $35.00 out-the-door, unlike Voyage Mobile which charges $39.00 per month for the same plan as Sprint Prepaid, plus tax and pesky fees such as the added to their bottom line (and not required to be collected) $2.50 fee for "Infrastructure Technology" and $1.50 fee for "Regulatory Recovery" in additon to the required to be collected governmental taxes and the USF. So, Voyager's $39.00 1GB service plan automatically becomes $43.00, plus any required to be collected taxes. If you need a home phone, grab a Magicjack, or use the home phone device via StraightTalk for $15.00 per month on the Verizon network. Remind me again why anyone/anybody use Voyager Mobile? You can still do Internet Radio @ 512K since most Shoutcast and Icecast stations stream @ 128K. Its Youtube that it would kill. Now the carriers that throttle lower than 128K are causing their customers to have a glorified paperweight for the rest of the month. I am on AT&T owned MVNO, Cricket, on a Group Save, paying $40/mo for 10 GB high speed data. I'm wondering... is AT&T required to charge their own MVNO, Cricket, the same amount for data as they charge a separately owned MVNO, for example, Straight Talk? If not, it seems that the separately owned MVNO's are doomed and will be quickly squeezed out. Shouldn't the answer be for Tmobile and Sprint to put up more antennas and reduce or eliminate the need for roaming? The operators have their hands full keeping up with capacity demands and filling coverage holes in the markets they already serve. Building out networks in new markets is expensive and not cost effective especially in lightly populated areas. A lot of the big four's rural coverage is the result of acquisition of regional operators rather than new build out.